Messenger Plus! 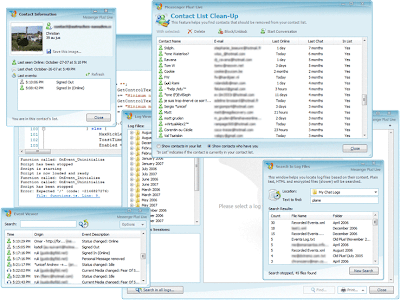 Live (known more as its former name Messenger Plus!, commonly abbreviated MsgPlus, MP!L, or incorrectly as MSN Plus) is a freeware add-on for Windows Live MessengerÂ . The software provides additional functionality to Microsoft’s Windows Live Messenger by adding its own controls to the main interface. These controls affect Messenger’s behaviour and appearance, often through additional dialog boxes. contacts on desktop. Windows always on top which show a specific contact. JScript scripting allowing users to add their own functionality. Version 4.80 is full compatibility with the latest version of Messenger, Windows Live Messenger 2009 and includes tons of features.